Abstract: Given the vast number of observations in a transparent environment, the interaction between players and referees in the National Basketball Association (NBA) provides a real-world laboratory that allows for observation and testing of implicit height-based biases (the so-called “Napoleon Complex”). Controlling for a plethora of referee-specific characteristics and including 4,463 regular season games from 2008 to 2012, we find that (i) more personal fouls are called when a relatively shorter three-person officiating crew is working and (ii) no more or fewer fouls are called when games involve relatively taller players. Such biases are probably not large enough to impact game outcomes but could affect gambling markets. Our findings support the conclusion that relatively shorter NBA referees officiate basketball games differently than their taller peers. The analysis spotlights an oft-suggested but rarely studied bias in a workplace where employees are heavily scrutinized and monitored. So, the "net neutrality" thing. John Oliver gives an overview and some background. Some problems with Mr. Oliver's (predictably) mushy view. 1. I can imgaine hearing some guy in 1915. "Our road system is not broken, and the guys who want to put up traffic signals are trying to fix that! (Laughter) There is no reason to allow innovation, or new ideas! Our horse and buggy system is working just fine! And it's fair: everyone can operate at the same horse and buggy speed! Unless EVERYONE can afford automobiles, no one should be allowed to travel faster than a horse and buggy can travel. Road neutrality! Let's keep the road-net safe for the Amish!" (Applause from the idiots who applaud that sort of thing). 2. In airplanes, we have first class. Hotels have suites. The world won't end if there are different levels of service. 3. But wait: competitors will be at a disadvantage! Yes, that happens all the time. The makers of buggies, and whips, and saddles, and so on, were all hammered by the advent of the car. There is no good reason to care about PRODUCERS. We should care about consumers. People want different things. If we allow producers to compete along the "faster service" margin, competition will spur faster service and lower prices. And everyone will be able to afford faster service. Outlawing competition along that margin will trap all of us at horse-and-buggy speeds. The analogy is the phone system, under Ma Bell: It "worked," but it worked by preventing competition. Once alternatives were legalized, the system changed in ways no one could have predicted. Now, landlines are fast disappearing. I admit this is complicated. The problem is that, as always on the John Stewart show, silly and superficial ideology is substituted for actual analysis. The FCC is trying hard to "protect" net neutrality, not to eliminate it. And the FCC should be our primary concern. That is the real threat to the internet, folks: The FCC is using net neutrality to try to control things. Far from a benefit, they are the bad guys. Congratulations people, we are back to square one. 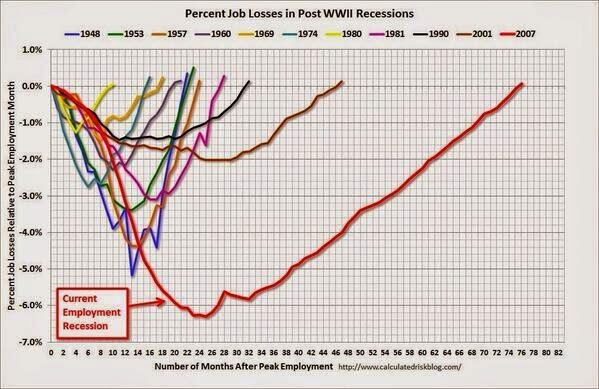 Yes, there are finally now as many people working today as there were before the great recession began. It only took 6+ years, way longer than any previous post-war recession, but at least there's one less bad thing to say about the economy now. In classic public choice fashion transportation infrastructure providers are clamoring that the Highway Trust Fund is going bankrupt and the message is echoed by the administration telling of the dire consequences of such insolvency. Such urgent cries seem self-serving and ignore the much more mundane analysis of what individuals of our nation need to effectively transport themselves and the goods of our economy. First, the gas tax is not going to expire and the congress while busy creating a crisis for what appears to be rent seeking purposes will extend spending authorization at least at a level of where receipts will provide, a 20% or 30% scale back of federal dollars is the real result, and each state while taking some time could determine if those expenditures where needed and raise sufficient revenue to address the cut back. On May 21, 2014, in the midst of the potential impending doom, the US DOT provided $2.1 billion to build a 3.9 mile subway line to reach the heart of Los Angeles Metro underserved transit dependent users in Beverly Hills. In the FEIS document prepared by the LA MTA and approved by the Federal Transit Administration (FTA) they concede the project is “Low” in cost effectiveness, but how low the cost effectiveness is should take ones breath away. If new passengers were required to pay required to pay a non-subsidized fare and no new riders left the system it would require an $80 ticket. While not standard in transit planning, I am proposing that assessing the amount users pay as an important measure of the value received. In many cases there may be justification for some subsidies for externalities, but a -98% return on investment seems difficult to justify. From an environmental standpoint, the emissions resulting from external efforts to provide the needed subsidy would be on the order of magnitude of 0.035 Tons of GHG emissions per new Purple Line passenger trip and likely generated 16 miles of driving per new Purple Line passenger trip. So even if the new transit were to have zero pollution, the pollution effects of the efforts to generate the needed Purple Line subsidy will far exceed the pollution of the no build, Bus Rapid Transit or Single Occupant Vehicles alternatives. May be the more telling values are the professional services fees for the complete project of $815,000,000, when annualized is $57,000,000, versus the annual $10,700,000 in ticket revenue. When your consultants are getting paid approximately five times more than the value the users are willing to pay, the incentives to get the value proposition correct don’t seem aligned. My own assessment is that nationwide funding close to current levels using market mechanisms does not seem wholly unreasonable, but based on the example above we need to reduce the federal funding portion and allow the state and local governments make the tough tradeoffs so they feel both the benefit of the facilities and pain of the purse. 1. Weld the tail on the donkey. This would be very exciting, blindfolded. 2. What if they had an election, and (almost) nobody came? Fortunately, Angus is on his way, to shore up that voting / participation number. 3. How strange. Why should you be able to vote in a primary, if you are not willing to say that that is your party? Parties are private organizations, folks. If they say register, you have to register. Or else not vote in the primary. I didn't know that the "Matthew Effect" was a thing. In particular, I didn't recognize the Bible reference. But then I'm not a Biblical scholar like Angus is. Abstract: This paper tests the assumption that evaluators are biased to positively evaluate high-status individuals, irrespective of quality. Using unique data from Major League Baseball umpires' evaluation of pitch quality, which allow us to observe the difference in a pitch's objective quality and in its perceived quality as judged by the umpire, we show that umpires are more likely to overrecognize quality by expanding the strike zone, and less likely to underrecognize quality by missing pitches in the strike zone for high-status pitchers. Ambiguity and the pitcher's reputation as a “control pitcher” moderate the effect of status on umpire judgment. Furthermore, we show that umpire errors resulting from status bias lead to actual performance differences for the pitcher and team. 1. Budget problems? Well, "doo" something about it! 2. Nebraska woman in Texas? Could it have been Sarah M? Spouse of Chateau? I expect not. An impressive performance, nonetheless. 3. My way, or no way. 4. Some reporters torture a poor press staff person for the Prez. I can't tell if she is serious, or desperately trying not to laugh herself. Her thesis: "The President does not give himself enough credit." If there is ANYTHING the President does, it is "give himself enough credit"! 5. Amar Bhide on wealth and income. 6. Don Boudreaux on wealth and income. 7. Skin in the game. Ick. 8. Cute. I like that his only choices were "the good devil/bad devil thing." Shouldn't there be a choice that doesn't actually involve the devil? Still, good for him. 9. This is why Mr. Overwater invented the internet. Very cute. 10. You can play with the baby. Or you can play the baby, like a guitar. 11. Fairtrade, yet again, shown to be simply a feel-good sham. Or, worse. 12. I can't believe people actually watch stuff like this. It's just an exploding dorm, dropped straight down onto its foundation perfectly. I can't believe I watched it three times. 13. A whole new way to be a dumb criminal. This is really, really dumb. 14. Poor pup. Though, poor passengers. 18. Corrections officers in NM try to hold their licker. 19. Have half of the unemployed given up? 20. "Moneyballing" Obama's foreign policy. Bob Lucas showed us that relying on reduced form historical correlations to predict the effects of a new policy regime is likely to end in tears. Yet this seems like exactly where we are going with government policy toward higher ed. Historically, college degree holders earn more money and have lower unemployment rates than to non-degree holders. So, in an attempt to increase earnings and employment, we are pushing for "everyone" to get a college degree. "Those returns underscore the importance of efforts to reduce the college dropout rate"
"At some point, 15 years or 17 years of education will make more sense as a universal goal. That point, in fact, has already arrived." People, I know this sounds bad, but maybe it's because so many people drop out that the degree premium is so high. Maybe if twice as many people got a bachelor's degree, the wage premium would fall dramatically. Degree attainment and wages are outcomes of a complex, simultaneous structural socio-economic model. Making policy recommendations based on one reduced form relationship from that model without an understanding of the deep parameters is very bad science and the recommended policy is extremely unlikely to have the desired results. It may seem strange for a college professor to be arguing that not everyone should be getting a college degree. But I have seen kids drift along for years, racking up debt and not human capital only to drop out and struggle. I have also seen thousands of kids make an economically unwise choice of major, get their degree and then struggle mightily. Not all "colleges" produce that big premium and more importantly, not all majors produce a big premium, as I discussed in an earlier post.